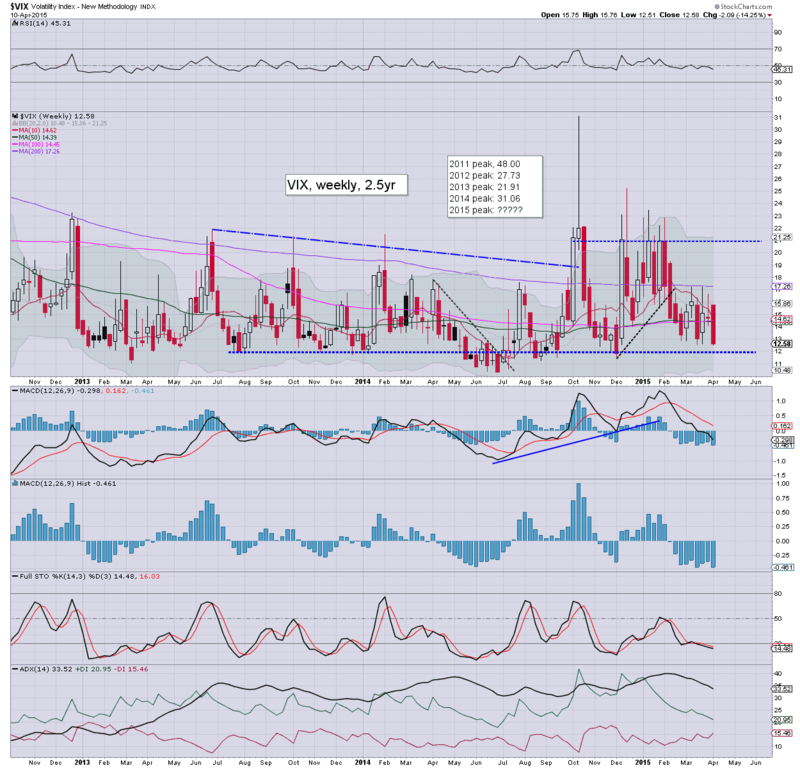 With a weekly sp'500 close in the 2100s, the VIX was naturally still on the slide, settling -3.9% @ 12.58. Across the week, the VIX fell by a very significant -14.2%. 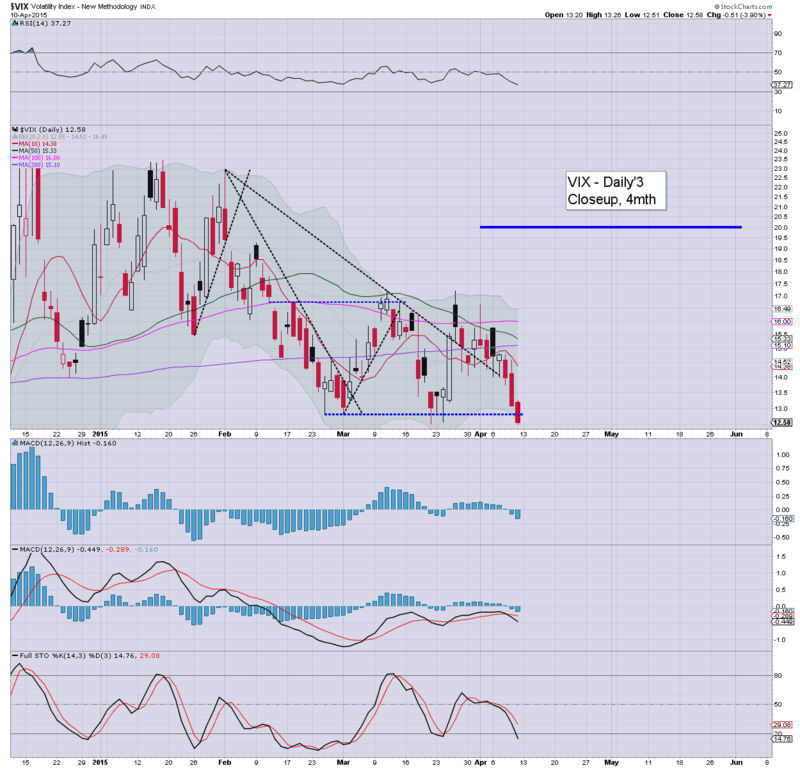 VIX looks set to remain subdued for the remainder of April, and perhaps all the way into mid June. With equities continuing to hold above old resistance of sp'2088/89, the VIX (not surprisingly) fell into the weekend. The big 20 threshold looks out of range until at least mid May.. if not June... when the key FOMC (June 17'th) is due. That could be an interesting time for volatility. The bears had plenty of opportunity this week.. but they simply had no sustainable downside power.. as also reflected in the VIX. The usual bits and pieces across the evening.. to wrap up the week. 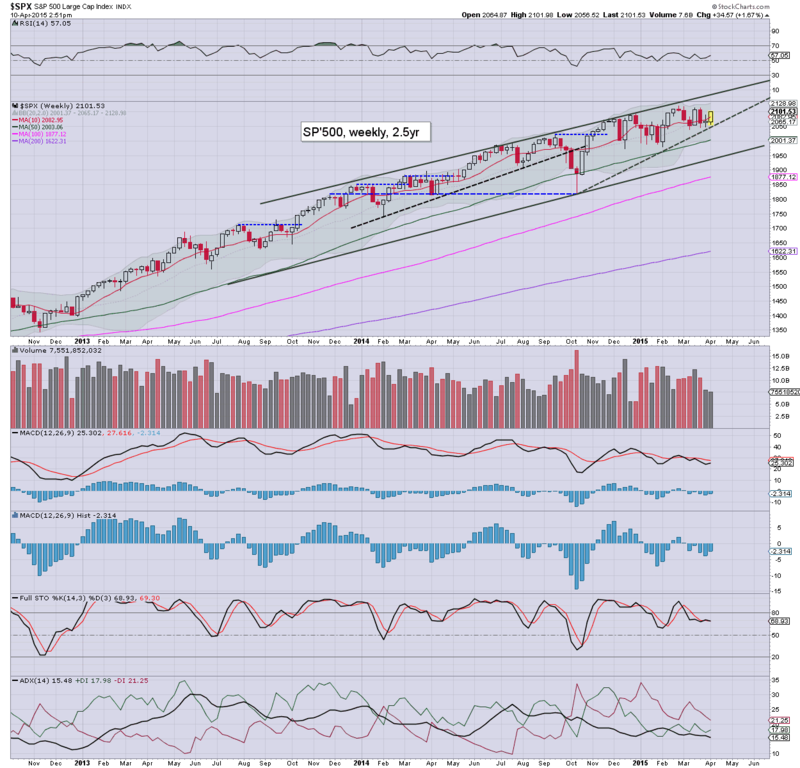 US equity indexes look set for a net weekly gain, with an sp'500 close in the 2100s. VIX is reflecting underlying market confidence, -2.7% in the 12.70s. Metals are holding gains, Gold +$10. Oil is +2.0%... although price structure is arguably still bearish for Monday. *Oil remains a tempting long... but not at this price. I'll let that one slip into next week, maybe it'll drop early Monday. A week for equity bulls.... there is little else to be said. notable strength: GE +10.2%, as people start to fully realise 'omg... underlying bid into 2018'. US equities continue to melt upward, sp +10pts @ 2101. Price structure is a baby bullish F flag.. offering further upside next Monday. VIX is reflecting a fearless market, -1.9% @ 12.80s. Metals are holding gains, Gold +$12. Oil is significantly higher by 2%, but still looks vulnerable. Market is in classic melt mode... set for a weekly close in the sp'2100s. 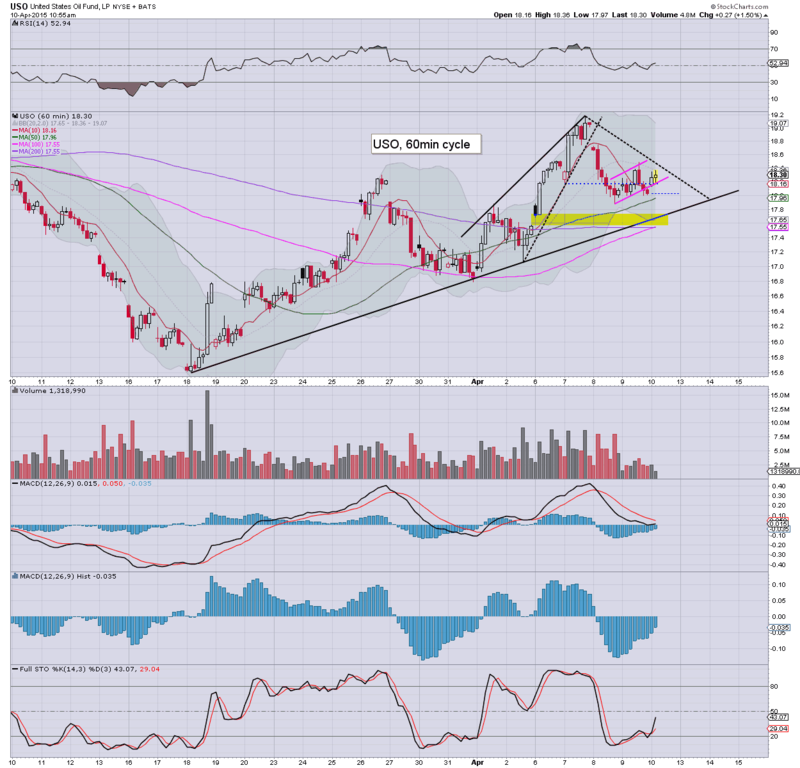 Notable strength: GE +9.1%... headed.. far.. far higher. US equities are in melt mode, with a weekly close in the sp'2100s now seemingly a given. VIX is naturally slowly cooling, -1.8% in the 12.80s. The 11/10s look viable if sp'2150/75 by late May/June. Metals are slowly cooling from earlier highs, Gold +$10. Oil is battling to hold gains into the weekend, +1.7%. Equity bears are powerless, and market is merely clawing slowly higher. New historic highs will certainly be possible next week. 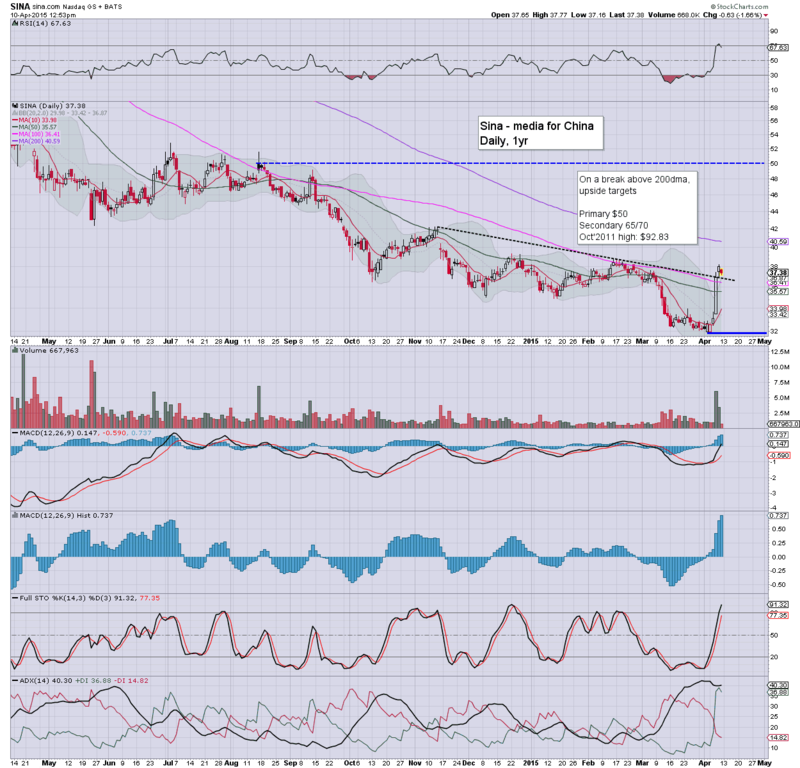 Interesting stock.. and I'll be covering SINA more in the weeks ahead. 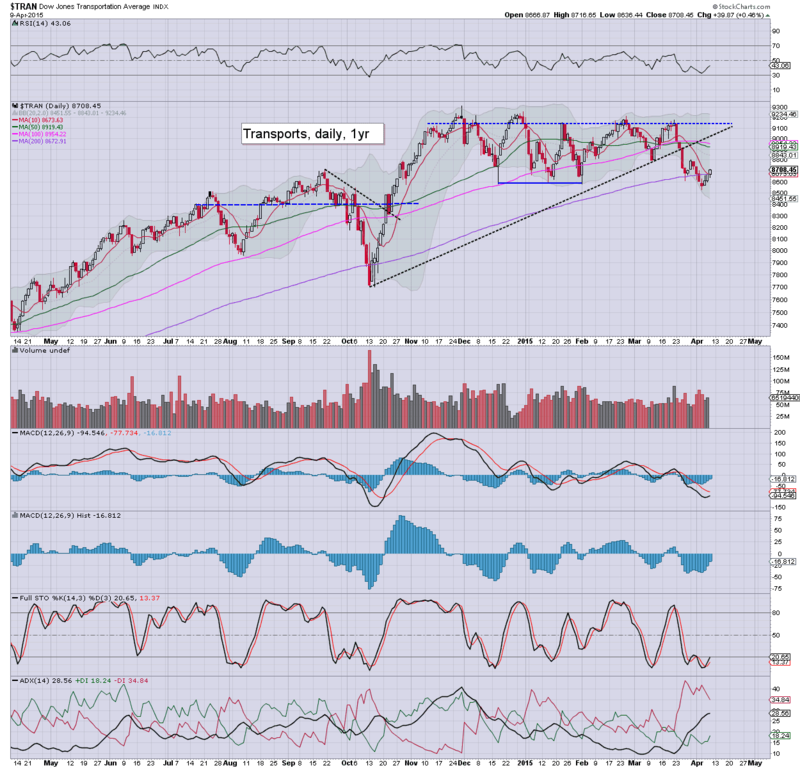 Most US equity indexes are higher for the fifth day of six, with the sp'500 on track for a weekly close in the 2100s. Metals are cooling from earlier highs, Gold +$11. Oil is +1.1%.. but still looks vulnerable to another 2-3% lower. *I still have eyes on Oil, but not at this price.. and structure is arguably still a bear flag.. if somewhat messy. Little to note... a week for the bulls.. despite having been stuck for much of the week. notable weakness: BABA -1.6%.. but comfortable holding above the newly built floor of $80. 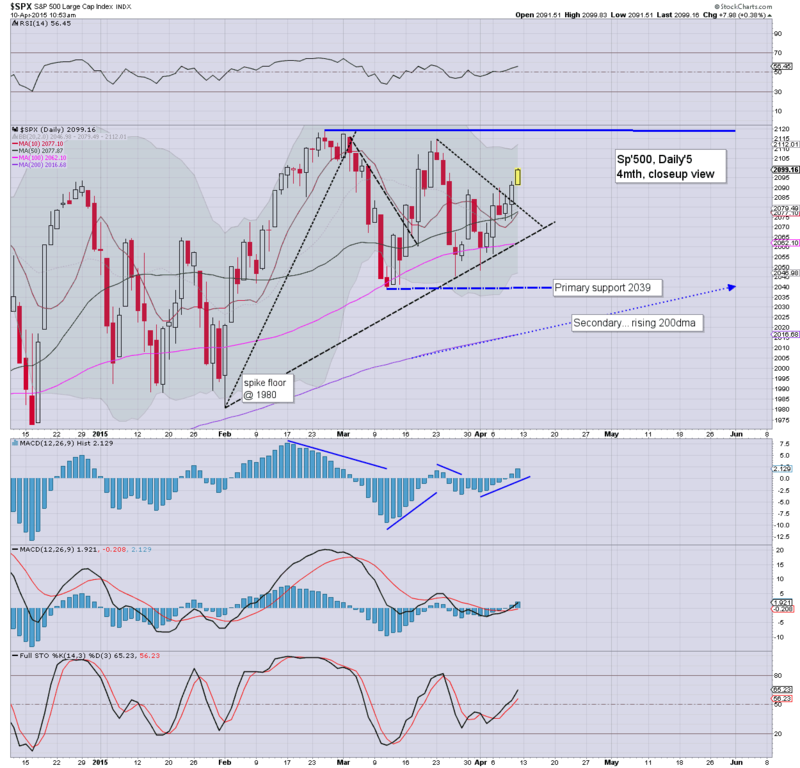 US equities are continuing to battle higher, with a probable weekly close in the sp'2100s. The near and mid term trends are clearly back to bullish, with viable upside into May. Metals are holding gains, Gold +$12. Oil is similarly holding sig' gains of 1.5%.. but as ever.. remains vulnerable. It remains a market with little concern.. after all... as companies keep on buying back their own shares.. how can the market ever see any kind of sig' down wave? 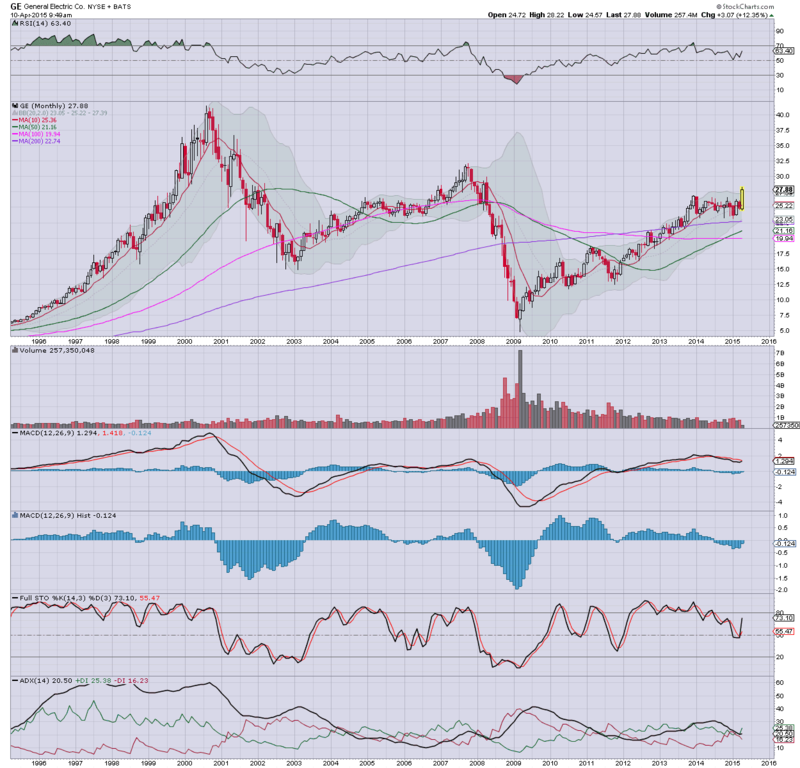 notable strength: ... not surprisingly.. GE +7.7%.. as yet another company decides to cannibalise itself. US equities open a little higher, with the sp'500 battling for the big 2100 threshold. 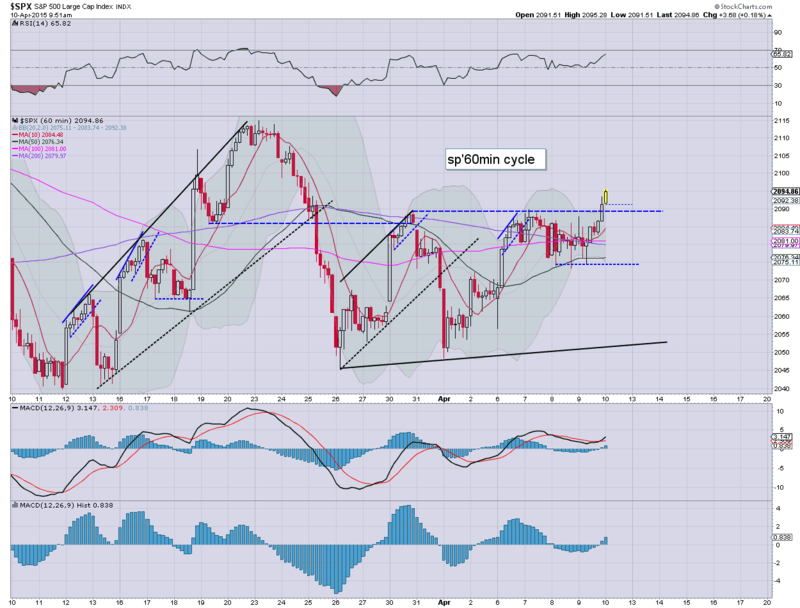 Metals are building gains, Gold +$14. Oil is holding sig' gains of 1.4%, but looks vulnerable across the day. There are notable gains in GE of 8.4% as Mr Market reacts to the latest share buyback announcement. *I'm keeping an eye on Oil... but have no interest in getting involved at this level. So.. we're a little higher.. with some minor chop. Fed official K' is talking this lunchtime... would not be surprising if the market is 'inspired' on more easing talk. Next target is the 2007 high of $32.14.. and then $41.42 of Aug'2000. Considering the giant share buyback program into 2018... why would GE not climb to the big $50 threshold? Or maybe you'd like to buy a US 10yr instead? Good morning. Futures are a little higher, sp +4pts, we're set to open at 2095. Metals are bouncing, Gold +$4. Oil is fractionally lower, -0.1%, and looking vulnerable across the morning. *I remain interested in going long Oil.. via USO. Target entry is the gap price zone... and that is certainly viable this morning. 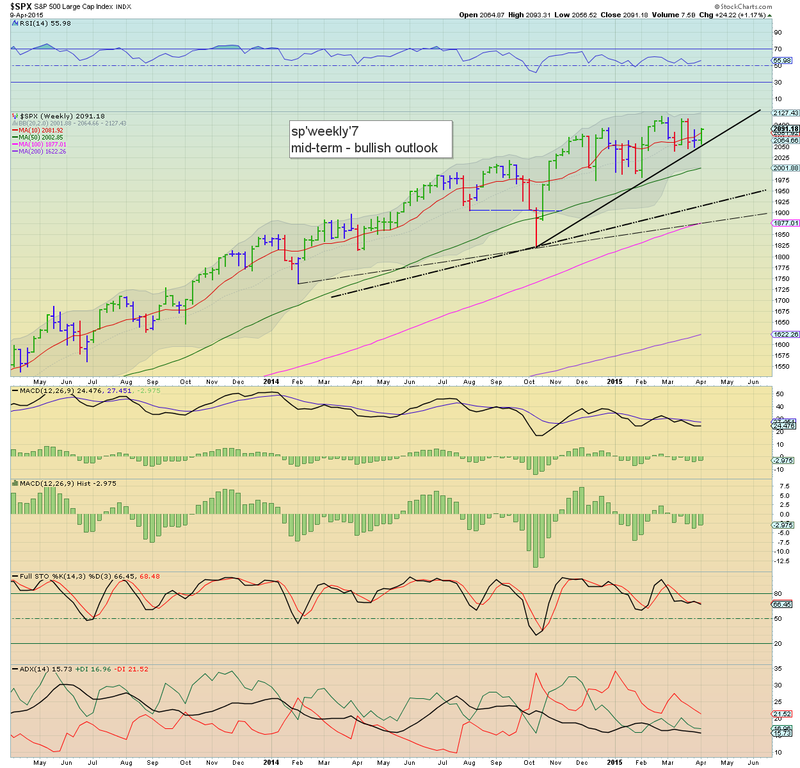 So... a weekly close in the sp'2100s is looking probable. It does look like new historic highs are now due.. with broad upside into May.... perhaps all the way into the June FOMC, when rates might well be raised. To be clear, I remain of the view that the economy should be able to cope with higher rates. Whether the financial markets get initially upset on such a move.... difficult to say. notable early strength: GE, +7.5%... as it announces a $50bn share buyback* - into 2018, along with GE capital disposal. *Share buy backs remain the bane of the equity bears. GE will now have a permanent bid under its own stock. 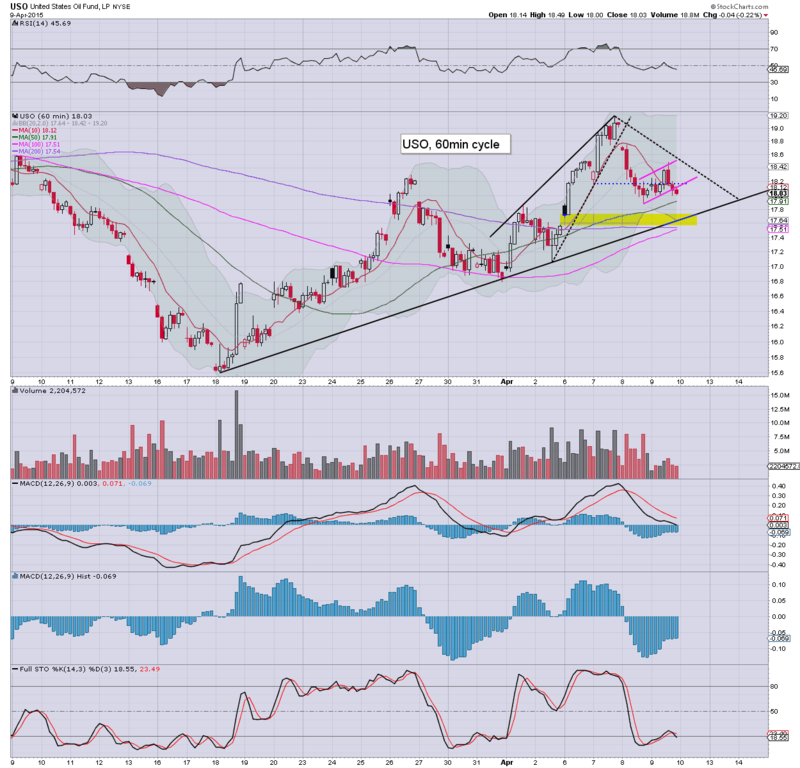 Certainly, shorting GE before the bulk of the buyback is complete, would seem a crazy trading idea. 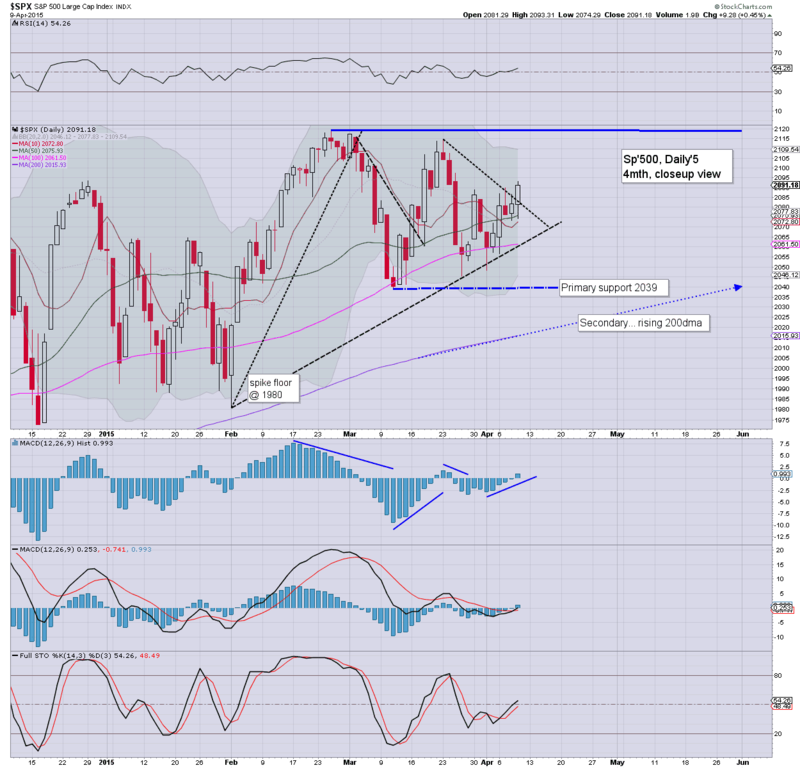 With a net daily gain of 9pts, the equity bulls managed a rather important daily close of sp'2091. The bigger weekly cycles look set to close the week outright bullish. The door is now wide open for a challenge of the upper monthly bollinger... which is currently in the 2160s. That would make for an interesting summer-short level. A notable green candle on the weekly 'rainbow' cycle. 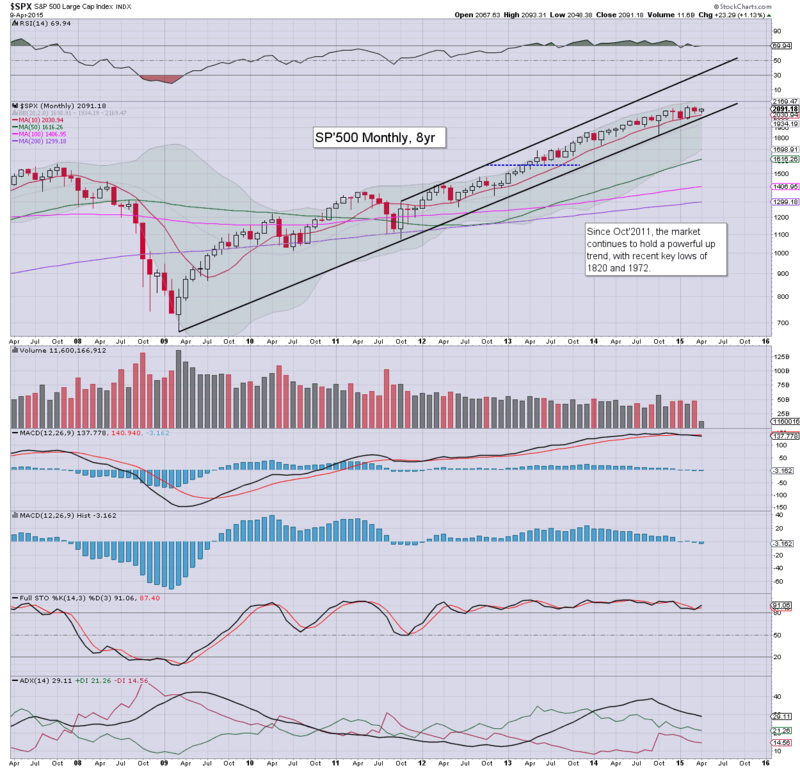 A weekly close in the 2100s is now very viable. Friday will see import/export prices, along with US Treasury Budget data. *there are two fed officials on the loose, not least K' who caused the equity bears some real trouble this past Monday. US equities settled moderately higher, sp +9pts @ 2091 (range 2074/93). The two leaders - Trans/R2K, settled +0.5% and -0.3% respectively. With the break above key resistance, outlook has turned bullish, with new historic highs in all indexes viable in the near term. The closing hour was a very significant victory for the bulls, and a weekly close in the sp'2100s looks possible, not least if Oil can attain a net Friday gain.